Larry King was the only CNN host qualified to interview the Scientology leader; while in contrast, Cooper lacked the intellectual heft to carry a one-on-one interview with any intelligent subject for any substantive length of time. In fact, however, Anderson Cooper did not want David Miscavige on his program... or at least not David Miscavige face-to-face in anything approaching a live interview that AC360 couldn’t reduce to a 10-second sound bite. Needless to say, Anderson Cooper chose the former—the pat, easily editable 10- or 20-second denial. In fact, both he and his producers made clear, in unmistakable terms, that they were not interested in full open access to the Church or its leader. That Cooper well knew Mr. Miscavige would never consent to such a cut-and-paste taped interview, on the order of what one sees on the nightly news of a network affiliate reporting on complaints from the local Waste Management Union, is pretty much a given. After all, what Cooper was seeking was tantamount to suggesting that a Pope respond, on camera, to allegations from some corrupt Vatican Bank official his Holiness had removed and excommunicated for financial malfeasance. Then, too, the only previous television interview to which the Church leader had consented was a 1992 appearance on Nightline with host Ted Koppel. It is still remembered in the annals of broadcast journalism. For here was a show originally scheduled for Koppel’s usual 30-minute slot, but so compelling was the exchange, so entirely unique in both the history of Nightline and live interview journalism as a whole, the segment was extended to a full 90 minutes. Moreover, the last half hour was entirely without break and all paid commercials were canceled (unheard of on network television). That the show was also critically acclaimed goes without saying; it earned an Emmy, which is the television equivalent of a Hollywood Oscar. So, no, Anderson Cooper well knew the Scientology ecclesiastical leader would not and could not consent to a sound bite or two. And, yes, Tommy Davis indeed supplied AC360 with an interview that—true to form—is sliced and diced to suit Cooper’s needs. More to the point: This was precisely the interview AC360 wanted instead of the wide-ranging one they could have had with Mr. Miscavige. But parallel to and actually predating the above, another CNN luminary had long sought an interview with Mr. David Miscavige. Moreover, this one was never intended as less than a serious interview, for this one would be conducted by the veritable face of CNN and the network’s only respectable name: the venerable Larry King. While just to cap it: The Scientology leader had previously informed King he was engaged in a longstanding Church project and the moment said project was complete he would indeed consent to a Larry King interview... which, as of the end of 2009, was exactly what happened. In reply and in anticipation of that long-awaited interview, King extends a dinner invitation to the Scientology leader. The invitation is promptly accepted and all is preordained...or so it seems. In the first place, and even CNN Corporate couldn’t deny it, Larry King was the only CNN host qualified to interview the Scientology leader; while in contrast, Cooper lacked the intellectual heft to carry a one-on-one interview with any intelligent subject for any substantive length of time. As a matter of fact, a review of Cooper’s CNN career reveals that his single-subject interviews average out to about 10 minutes or less with only two exceptions, each 20 minutes in length, one dating from 2006 and the other 2009. Consequently, any King interview with the Scientology leader would only accentuate Cooper’s professional inadequacies. Then again, and herein lay what really furrowed Cooper’s brow, the Larry King interview was positively guaranteed to outshine anything AC360 could muster; for this was to be an interview concerning the whole Scientology panorama and would actually take viewers inside the Church and thus inside Scientology in total. Mr. Larry King and team are cordially invited to attend the largest international Scientology event of the year—the 25th anniversary of the International Association of Scientologists, no less. The team is further invited to set up a camera station in the event hall for interview access with any Scientologist in attendance. Finally, King and his production team are afforded an invitation to the grand opening of new Ideal Churches of Scientology in Rome and Washington, DC, plus entirely unfettered access to the Church’s spiritual headquarters in Clearwater, Florida. 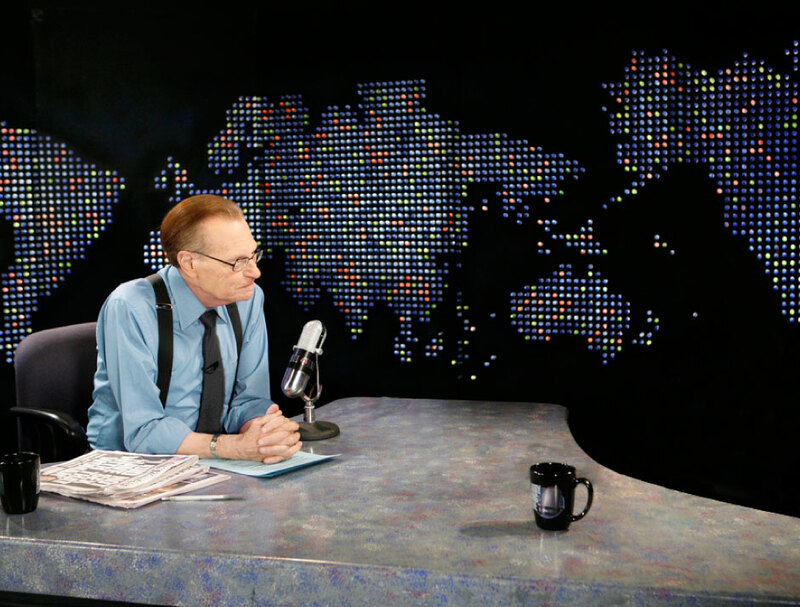 And were all that not enough to give Cooper cause for grave concern, Larry King is assured a “free-to-ask anything” access in his live interview with Mr. David Miscavige. So even if only in terms of sheer audience appeal, were the reigning King of American talk shows to interview the Scientology leader, it would all but blow Cooper right out of the water—not to mention off the screen. The Scientology leader was disinvited to dinner with Larry King. Or more precisely, CNN Corporate ordered Larry King to “disinvite” Mr. Miscavige to dinner. Embarrassment for the iconic Mr. King be damned, the corporate position was the rule of the day. But one wonders if he was ever told the corporate dictate was prompted by the demand of his so-called “co-worker” Anderson Cooper. Whereupon all other CNN shenanigans become abundantly clear, including why the lapse of nine months between AC360’s first contact to the Church and the night the broadcast finally aired. To wit: CNN Corporate was concerned that an all-access Larry King special report would have revealed the sham of the AC360 investigation—all of which, in turn, would leave Cooper looking all the more foolish. But having now torpedoed the King interview with Mr. Miscavige, CNN was boxed in. Their bias—and particularly that of Anderson Cooper—was too blatant to just sweep under the carpet, or hide in the closet. Result: CNN Editorial Director orders a “hard reset” on the AC360 Scientology program. Meaning, in unmistakable terms, they would start over and do it right. Apparently Cooper threw another fit. For the fact is, and notwithstanding CNN Corporate dictates to him, he never again contacted the Church. Months rolled by—November, December, January, February…not a single word from AC360 or CNN. And all while interviews had been previously scheduled, Church tours arranged—all of it dropped and replaced by deafening silence. CNN’s activity—or rather, lack of activity—made abundantly clear the program was dead. Then came March and, totally out of the blue, the Church is informed, via a CNN press release, that Cooper’s program was airing. Five months had passed since the CNN “hard reset” without a single communication in all that time, let alone any attempt to conduct the interviews Church executives had demanded and for which Cooper had agreed. What happened? Nothing but the passage of time—five months—during which period Anderson Cooper’s ratings are plummeting down the St. Moritz death slide. As for sabotaging Larry King’s interview: Well, Anderson Cooper is nothing if not self-serving. Cooper had no meaningful response. What a guy. Any reputation he’s earned has been thanks to his maternal genealogical line. And CNN Corporate had descended to the level of acceding to the whims of Anderson Cooper: AKA Mr. Vanderbilt.